In order to replace the A-1 Skyraider, as a carrier fighter, the US Navy required a new fighter SPECIFICALLY built with the following characteristics: no more that 500 MPH speed, capable of carrying 2000 pounds of ordnance at a range of 460 miles, and at a cost of $1.000.000 per unit. Together with Ed Heinemann, Douglas Aircraft began to look for the answer to such request. After many hours of working in the design and drawing departments, the profile for the A4 came out. U.S. Navy officers didn't like the design because the plane was too small according to their expectations, but "Ed" convinced them that not always BIGGER and MORE SOFISTICATED was the best. On June 21, 1952 they signed a contract for the building of two prototypes, plus another 19 pre-series units. At this point it might be interesting to point out that the A4 is considered the most successful design in the aviation history. The #1 prototype, XA-4D1 (Bu. N° 137812) made its first flight on June 21, 1954 under the command of the test pilot Douglas Rob Rahn . This first flight revealed some turbulence in the rear part of the plane but the problem was solved with a modification in the rudder and the engine exhaust. Once these problems were overtaken the A4 showed itself as a VERY MANEUVERABLE plane, and the Navy conclusions about the plane were more than satisfactory. From then on, the A-4's would get the new code according to the new versions, eg. : A-4F, A-4M. In the '70's decade, the U.S. Navy discharged the Essex Class carriers. That gave a very short horizon to the A-4's career in the U.S. Navy. 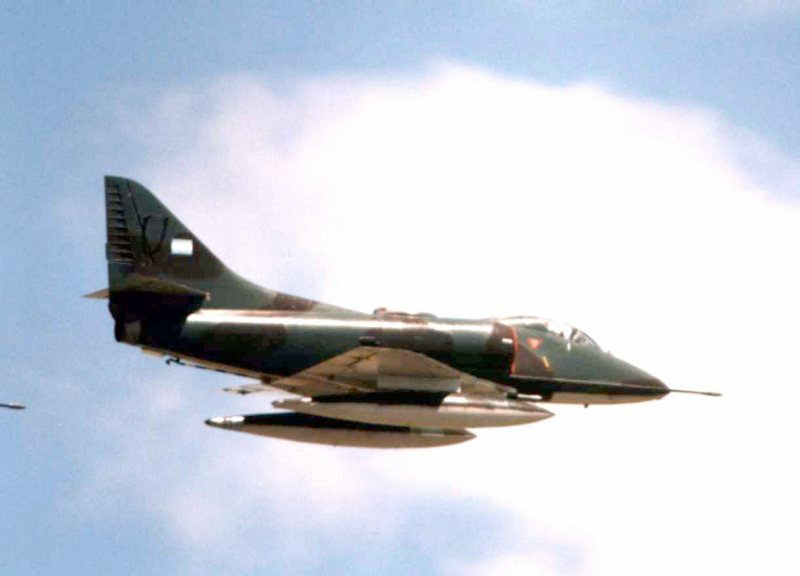 The Marines knew that they could have more A-4's than A-7 Corsair II, at the same cost, so they asked McDonell Douglas to develop an improved version of the A-4; that gave birth to the last development of the A-4 model, the A-4M (M for Marines). This plane had its first flight on April 10, 1979. They began to deliver these units to the VMA-324 a year after. The A-4 production continued until 1979, when the last of the A-4M was delivered to the U.S.M.C. (United States Marine Corps), making a total of 158 units which were in use until the end of the '80's. At the beginning of the '60's, and since 1947, the Argentinian Air Force (FAA) had the Gloster Meteor Mk.IV as its main aerial defense airplane; there were also 28 F-86F40 Sabre fighters. 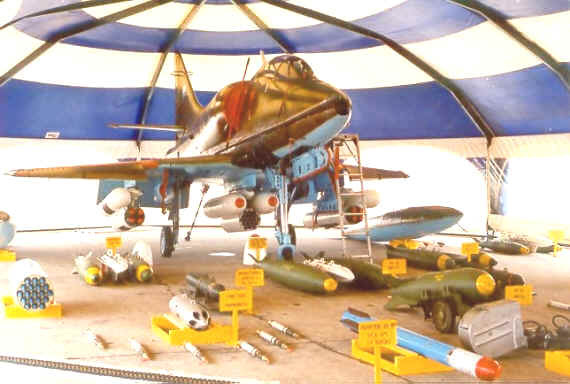 All in all, it was quite clear that that amount was not enough to cover the aerial defense of the whole territory, besides that, Chile was expecting the arrival of several Hawker Hunters recently acquired to the United Kingdom, which provoked an unbalance in the air power for the region. Due to that situation, in 1966 the FAA acquired 50 Douglas A-4B from the United States. The original contracts provided the updating of these units, proper training for the Pilots and the Technical Group personnel, plus a big amount of replacement parts. Due to the great amount of modifications that the planes had to went through, this new version was designated as A-4P, although the FAA kept calling it the "B". October 31, 1966 was the date for the arrival of the first units. All the units were brought by plane from de U.S.A to Villa Mercedes (San Luis), base of the V Brigada Aérea (Fifth Aerial Brigade), the flight was made in several stages, with technical stops in different Air Bases. Douglas kept their delivery schedule and on March 18, 1967 the second group arrived (12 airplanes) with two more cargo flights (1969 and 1970) completing the total of 49 units. We must say here that unit C-203 was destroyed in the U.S.A., and it was never replaced. Due to the technological leap represented by the presence of the A-4B's, the FAA, as a whole, became involved in an extensive training program in the United States. The A-4B was the first fighter in the FAA capable of being refueled in flight, but at that time there were to tankers in the FAA. That problem was overcome with the use of the Buddy Pack system, that is, from one A-4B to another A-4B. This problem was fixed a little later when the 2 KC-130H (TC-69 and TC-70) arrived in 1969. 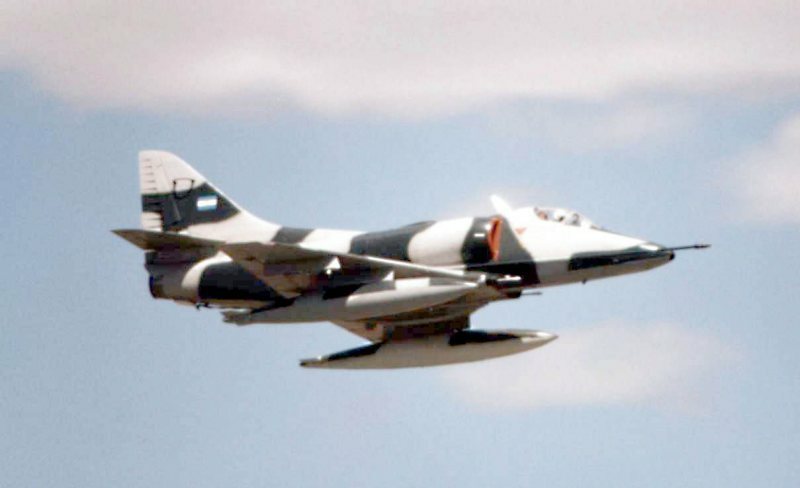 Here we must mention a detail, and that is that all the aircrafts used in Argentina received "spoilers", and the A-4C's came with two additional fastening points under the wings. These additions were available from A-4E's on. The South Atlantic conflict with England gave a very significant place to the A-4B/C's, they went to combat with a 16 year practice in operations. When the war had finished, the number of units in the V° Brigade (5th Brigade) was severely reduced, that is why they decided to regroup the SDA (weapons system) A-4C's with the A-4B's from the V° Brigade increasing their number. Meanwhile, they were expecting the arrival of the Mirage III CJ (denominated Mirage III C by the AAF) which were going to fill the places left by the downed A-4C's. 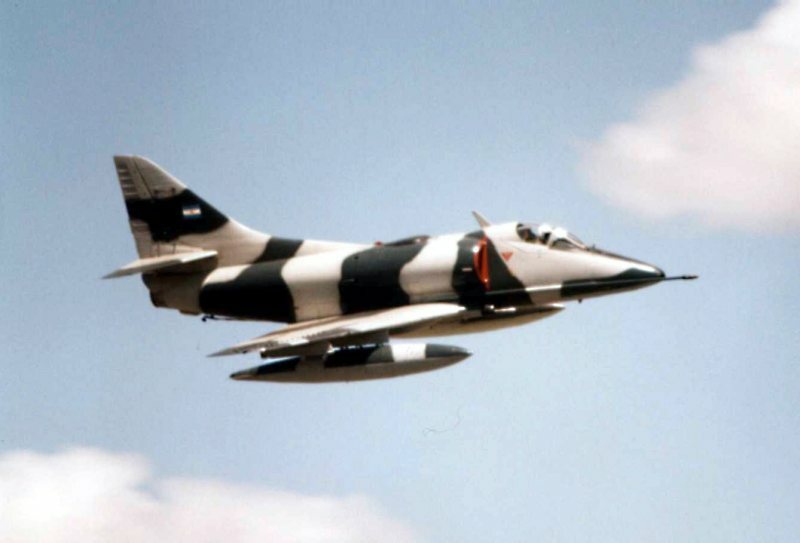 It is worthwhile to mention that the AAF never lost its fighting capacity; moreover, it replaced all the loses in the Malvinas (Falkland) war with other aircrafts like the Mirage 5P (10 units which were converted later to the standard Mirage 5A "Mara"), the Mirage IIIC (19 single seat units and 5 two seat units), the FMA delivered more "Pucará" brand new, and so the list goes on. 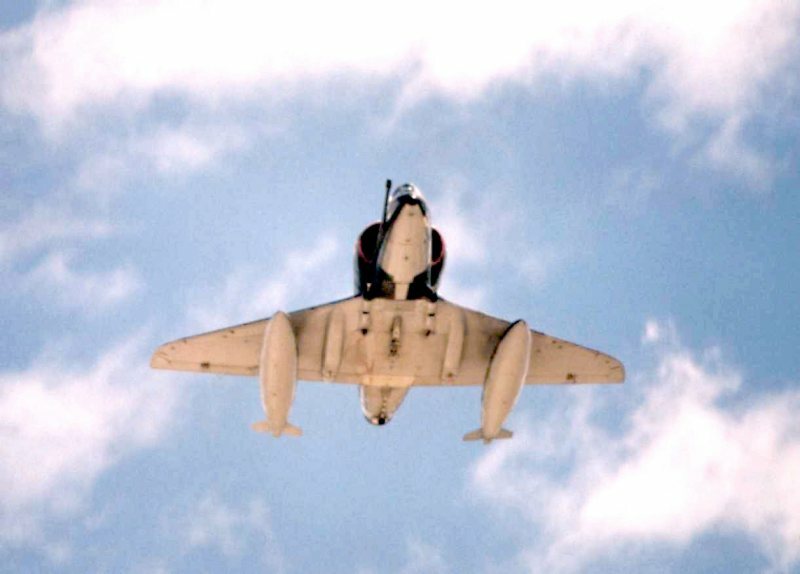 The A-4C's (A-4D2N's), became the most numerous variant in the Skyhawk saga. This aircraft had a good ALL WEATHER capacity, that means that it could fly no matter the weather conditions, thanks to the AN-APG53A radar equipment specially designed for the A-4 model. There were only 638 A-4D2N models built. Among the modifications, necessary in order to homologue this version, there were: the lengthening of the nose in order to accommodate the radar equipment, the TPQ-10 "blind" bombing system, one AJE-3 low bombing/course and altitude reference system, and the AN/ASQ-17 electronic control center. They also redesigned the instrument panel with the addition of a navigation flight control, manufactured by Douglas. The first flight took place on August 21, 1958. The plane was powered by a J65-W16A turbo engine, with a 7700 pound thrust power. The first U.S. Navy Squadron to be equipped with these units was the VA-192, which began service on May 1960. A total of 29 U.S. Navy squadrons received the new A-4, and only 100 A-4C's were modified to the standard A-4L. The first flight was made on August 21,1969. These A-4's had a "hunch" behind the cockpit that extended up to the beginning of the tail rudder. Most of these updatings were made by the U.S. Navy, and very scarcely by Douglas or any other contractor. According to the experience and the outcomes attained along 9 years of operations with the A-4B's, the FAA acquired 25 Douglas A-4C from the United States during 1975. This group of fighters replaced the veteran F-86F40 Sabre belonging to the IV° Brigada Aérea at El Plumerillo (in the Mendoza province). These aircrafts were bought on an "AS IS" basis, so the A-4C's didn't receive any overhaul or engine retrofit, nor any updating of its avionics; that's why all that work was performed by the Área Material de Río IV (Río Cuarto, Cordoba). During April 1976, the IV° Brigada Aérea (Mendoza) received the first 4 A-4C's, the delivery period ended by mid 1978. 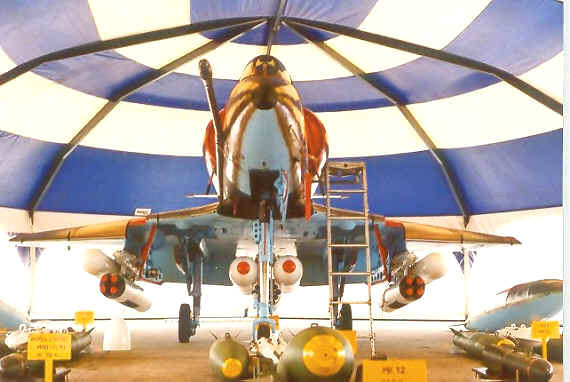 At the end of that year, and because of the tense political situation with Chile, the Air Command decided to arm the A-4C's with AA R Shafrir missiles. 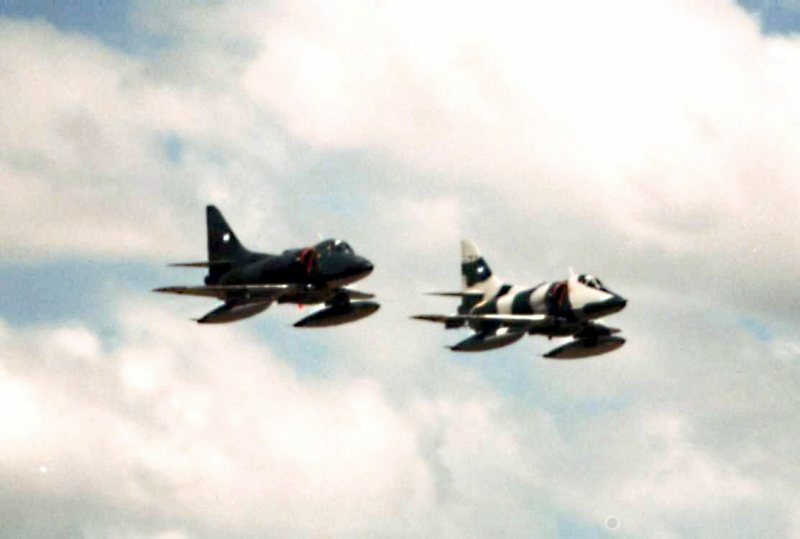 It is almost impossible to detail all the missions performed by the Escuadrón A-4C during the war in the South Atlantic, we would need many pages to describe them, but I must remark the high professional level and courage put up by the pilots as well as the high performance of the aircrafts, during those battles. After the war, the four surviving 4-AC's were reassigned to the V° Brigada Aérea, together with the A4-B's, where they kept operating until the visible wearing made necessary the replacement of the Veteran Hawks. At the beginning of the 90's decade, the government began the negotiation process with the U.S. for the acquisition of 36 A-4M bomber fighters, in order to replace the Veteran Hawks. The contracts for the acquisition of these airplanes stated that they should be delivered completely overhauled and with an engine retrofit to 0 hours, and they should incorporate the last generation technology for these aircrafts. They finally were equipped with the ARG-1 (APG-66) radar equipment. At that moment, the A-4B/C's didn't have much service time left, so on December 1997, the first 4 A-4AR Fighting Hawk (an updated version of the A-4M) arrived to Argentina. The "old" Bravos and Charlies remained in service as trainers for the new "HALCONES" (hawks), until March 15, 1998 when they made their last official flight, in order to commemorate different anniversaries in the V° Brigada Aérea. The final dismiss for the A-4B C-207-222-225, A-4C C-314-322, came on March 1999, and March 31 of that same year, was the last day for the A-4B C-214-221. This marked the end of the Hawk saga, which earned a well deserved and important place in the AVIATION HISTORY of our country. The last official flight for the A-4B/C came on March 15, 1998. This last flight was during the commemoration of several flight units in the FAA, and it took place in the V° Brigada Aérea site. The final retirement for the units A-4B C-207 / C-222 / C-225, A-4C C-314 / C-322 came on March 29, 1990, and the A-4B C-214 / C-221, were officially discharged on March 31, 1998. These events marked the closing of a chapter written with glory and honor, giving these remarkable aircrafts a privileged place in the Aviation World.